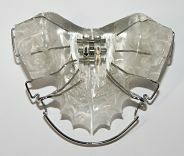 HQ Dental is able to manufacture and provide removable braces for minor orthodontic works. Removable braces are one of the most effective orthodontic appliances at straightening teeth. They are mainly used when a patient does not require that much work on their teeth and are made of a plastic plate and wires which are removed when eating food and cleaning teeth. They work just the same as fixed braces, with the wires being tightened throughout the course of the treatment to help move the teeth in to the correct position. If you require a removable brace made for one of your patients, please do not hesitate to get in touch with our laboratory team today with your specified size requirements.